Jaki Shelton Green was installed as North Carolina’s ninth Poet Laureate on Wednesday, September 19, in a ceremony in the old House Chamber at the State Capitol in downtown Raleigh. Governor Roy Cooper announced Green’s appointment last month, succeeding Shelby Stephenson, named poet laureate in early 2015. A native of Orange County, Green has been active in North Carolina’s literary and teaching community for more than 40 years. 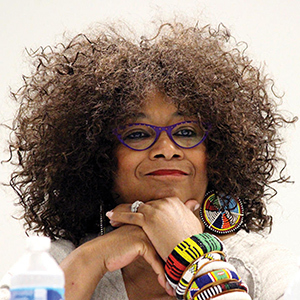 Author of eight books of poetry and co-editor of two poetry anthologies, she is a North Carolina Literary Hall of Fame inductee and the recipient of the North Carolina Award for Literature in 2003. Green currently teaches Documentary Poetry at Duke University Center for Documentary Studies. Over the last 40 years, she has taught poetry and facilitated creative writing classes at public libraries, universities and community colleges, public and private schools and with literary organizations across the United States. She plans to focus her efforts on the creation of documentary poetry, working with North Carolina communities to explore the ways they document their unique regional histories and significant historical events. For more information contact the North Carolina Arts Council at (919) 807-6500 or visit www.NCArts.org.